This innovative tall and narrow stand deters youths from sitting and congregating around it. The Tall Stand has parking badges and reflective bands to aid the visually impaired. Available in mild steel or stainless steel grade 304, satin polished finish. 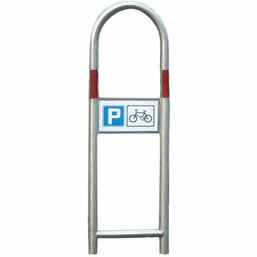 This bike stand can help contribute towards gaining 2x ENE8 Cycle storage credits when used in the appropriate situation, under the Code for Sustainable Homes. Underground Fixing dimensions: 550mm wide x 1950mm tall. Baseplate: 60mm x 60mm. 50mm tube o/d diameter, 2.5mm wall thickness. Approx weight: 18Kg. Overground Fixing dimensions: 550mm wide x 1450mm tall. Baseplate: 150mm x 150mm with 8 M12 size holes total. 50mm tube o/d diameter, 2.5mm wall thickness. Approx weight: 16Kg. Finishing: Available in galvanised, powder coated RAL code (enter code) or stainless steel.